Our customers have always asked us some very important questions about what we do here at Gulton. 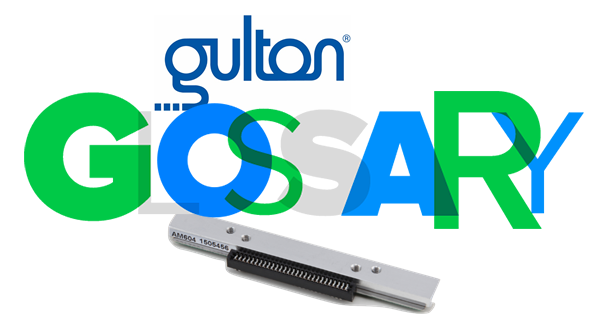 As a printhead purchaser, it’s important for you to feel comfortable with our products and have a basic understanding of Gulton’s manufacturing process and the components used in that process. You can check out our manufacturing process as we take you step by step through our facility in South Plainfield, New Jersey: https://www.youtube.com/watch?v=WFHOxgf0YEQ&t=104s. dissipated away from the device thereby allowing regulation of the device's temperature at optimal levels. o A driver chip is an electrical circuit or other electronic component used to control another circuit or component. other features etched from one or more sheets or substrates. to produce an image. Each dot pixel is controlled separately through the connector that connects to the logic of a printer. medium, while still enabling the heat they generate to produce quality printed characters. elements, and terminate transmission lines. o Connectors allow the flow of voltage and data through flexible cables connected to logic and power. As the experts in printhead manufacturing, Gulton seeks to educate our customers and potential customers about how printheads are produced and, in addition, how they can be kept functioning at an optimal level. It’s our responsibility, not only as your business partner, but also as the only U.S.-based printhead manufacturer. We’d like to invite your questions and comments. Please email them to: jdigiovanni@gulton.com and we’ll be happy to address them.